Dontaye Bell needs five days to make this dish. He'll start roasting chickens and making stock on the Tuesday before the festival. He also smokes ham hocks, turkey legs, chickens and sausage. "How do you impart a ton of flavor to a product? I'm always working on this," says Bell, who cooked on the line at Delfina for six years before going independent, selling pulled pork sandwiches out of the trunk of his car. "A lot of my techniques and philosophy come from Delfina," he says, even though his food seems completely different. "Sourcing food. They do a lot of sauces. That's why we do everything in house. We have more control." 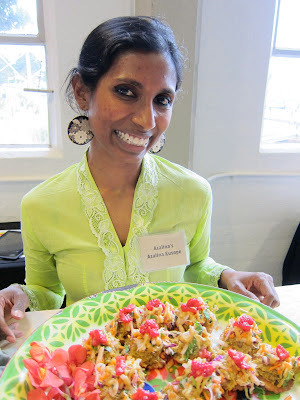 Azalina Eusope did my single favorite dish at last year's festival, the Penang Curry Bomb. She said she wasn't content to serve the same thing again. Damn. And here I was salivating at the idea of having another. 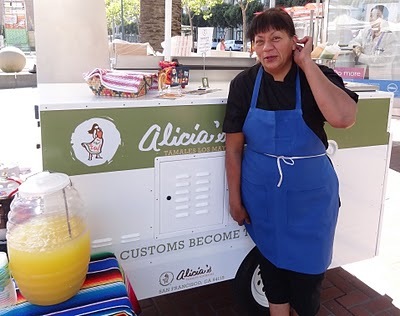 Fortunately, Azalina is a great, intuitive chef who caters when she's not at the Friday night Off the Grid gatherings at Fort Mason. She uses 45 different spices to create the chicken rendang that goes into Malaysian Chilaquiles, and you can really taste the complexity. You want to savor every bite because the flavor has so much going on, yet it's not overwhelming because it's not particularly hot. "We cook it for six hours to get all the flavors together," she says. "We have a different influence for curry in Malaysia than in other countries. We use lemongrass instead of coconut." The dish has both textural and flavor complexity: it's served on a crispy scallion flatbread topped with coconut jam, and it's topped with sliced raspberries. It's unforgettable. Normally I wouldn't eat tamales at a food festival because most are so heavy. What's great about Alicia Villaneuva's tamales is the lightness of the masa, which allows you to enjoy the pristine flavors of the fillings. I like the carnitas tamale, but my favorite is the Oaxacan cheese, which gets a slight kick from mild pepper slices. Villaneuva learned to make tamales from her grandmother and used to sell them door to door, just knocking on people's doors. That takes courage. Now she has a tiny food cart and a huge smile on her face when she sees somebody enjoying her food. That's going to be you. Everything you need to know about the Street Food Festival is here. Don't miss it!